As much as we love to eat healthy, we are no stranger to the take out craving ... especially on Friday night! Our skinny secret is how we handle these sneaky cravings. Instead of dialing up a carton full of calories, we love to make our own takeout and this one is sure to please! Tonight we're making our take on sweet & sour pork. Our sauce is a sweet & tangy blend of low sodium soy sauce, pineapple juice, rice wine vinegar, honey, fresh garlic & ginger. 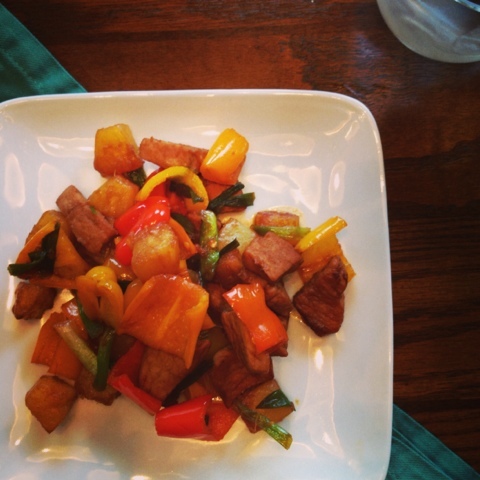 We stir-fry up our organic boneless pork with a mix of pineapple, red bell pepper and scallions. With all the flavor this dish serves up, we have no problem going low carb tonight but you can certainly serve this up over a serving of brown rice if you choose too! So put down the phone, kick the excess calories & sodium to the curb, and join us while we make our own take out tonight. Hope you enjoy! 1. Mince garlic & ginger root - reserve half and add half to marinade. 2. To make marinade, whisk together garlic, ginger, soy sauce, pineapple juice, vinegar & honey. 3. Add pork and half of your marinade to bowl and let sit for 15 minutes (or longer!). 4. Chop pepper & scallions into one inch pieces. 5. In deep sauté pan, add olive oil and heat to medium high heat. Add garlic and ginger and cook 2 minutes until fragrant. 6. 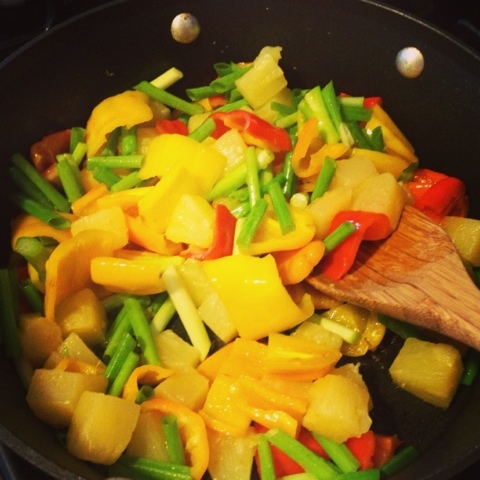 Add peppers, pineapple & scallions and sauté for 3-4 minutes until tender crisp. 7. 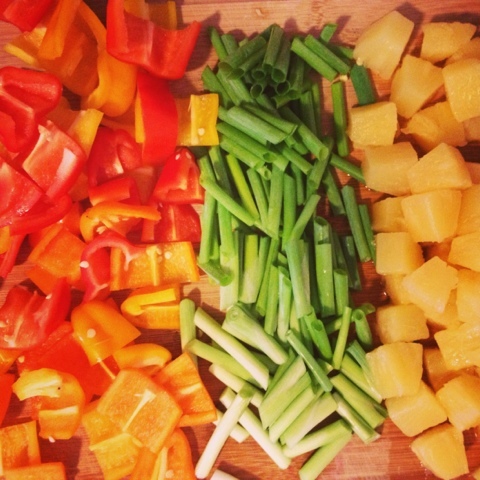 Remove veggies and set aside. 8. Add pork to pan and sauté for 5 minutes until cooked through. 9. Add veggies, remaining sauce and stir to combine!